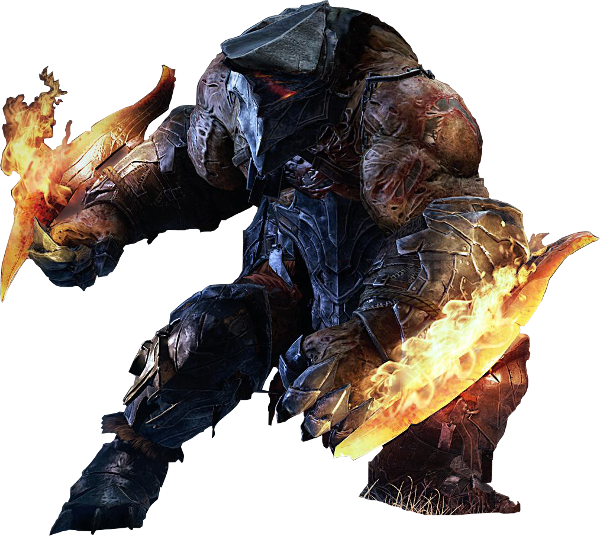 The Champion is a Boss you face in Lords of the Fallen. Very agile and very brutish, he is often susceptible to be enraged. Using a Kite shield or a Tower shield can stop his charges. He is marked as 24 in the map below. The Champion is very susceptible to the "Prayer" spell; when cast, the Champion will attack the decoy, allowing the player to get a few attacks in. This is a decent strategy for melee players. Players should keep their distance from the Champion to avoid his charge attack (he sprints quite quickly, meaning if players are too close they won't have much time to roll out of the way), and use Prayer after he has finished charging. Using Tower Shields is also a very effective strategy; when the Champion attempts to charge the player, plant the Tower Shield into the ground and the Lord will recoil off the shield, again allowing for a few hits. Keeping one's distance from the Champion and attacking with ranged weapons, such as the Gauntlet, is a safe strategy, but may be slow if the player doesn't have the correct Runes for their Gauntlet or hasn't invested in magic. Charge He hits the ground then runs at you, knocking you down and dealing a lot of damage, especially if the champion is enraged. He will stop if he hits you or a wall. You can plant a tower shield down to stun him if he runs into it, giving you an opening to attack. Rage His Rage meter fills up every time he attacks or is attacked. DoT attacks such as poison and fire will assist in filling up his Rage meter. Wombo Combo 2 Quick slashes followed by an uppercut. These can be blocked, but will consume large amounts of stamina. Drill strikes Overhead move followed by smashing the ground, sending underground projectiles that seek and will explode quickly once they reach the player. The champion will send 2 of these each time. You can roll, sprint, or jump out of the way of this easily. Flaming knives In the latter half of the fight, he will replace Drill strikes with flaming knives. He will throw 2 of these at a time, you can easily dodge these by applying the same strategy that you did against the Drill strikes. Special Challenge: Defeating this boss without letting him enrage will result in you obtaining the an orange version of Sting. Phase changes are not enrage. And how exactly do you stop a rage meter that fills when either of us do damage????? Does anything happen if during the charge hits multiple times the closed gate he hits during the cutscene ?